I believe that the first time I heard about Percival Lowell was reading the book “Marte y Vida, ciencia y ficción” (in Spanish; by Bartolomé Luque Serrano and Álvaro Marquéz González, the former being a teacher I had while at the university – “Mars and Life, science and fiction”). The reference to Lowell in the book was due to his drawings of the canals of Mars which promoted the idea of intelligent life in the planet. Thus, I mistakenly did not take the person very seriously at first. 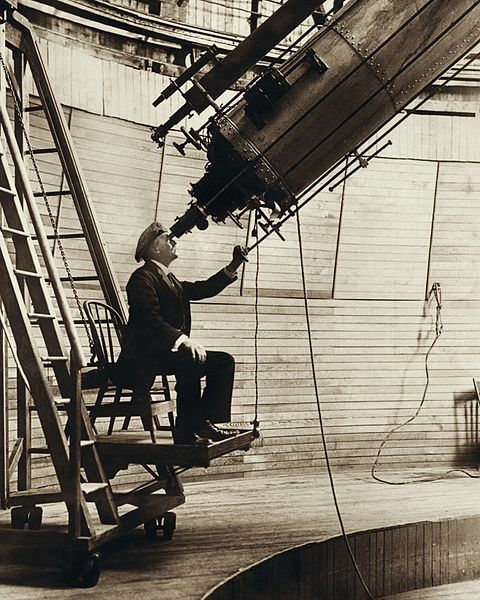 Percival Lowell observing through Alvan Clark telescope at Lowell Observatory (public domain image). Percival Lowell descended from a wealthy family from Boston (1), graduated from Harvard and dedicated a great part of his life to astronomy. 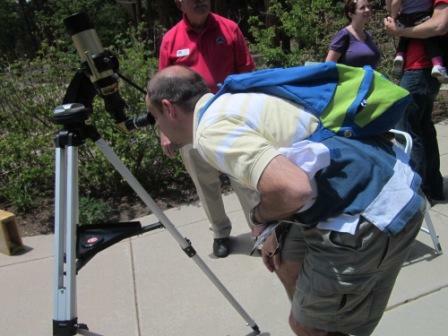 Lowell founded the Lowell Observatory in 1894 in the city of Flagstaff (AZ). He made several observations of Mars, Venus, searched for Planet X and set out the non-profit which operates the observatory till today. Even if not by Lowell, Pluto was discovered in his observatory in 1930 by Clyde Tombaugh near the location expected for Planet X. 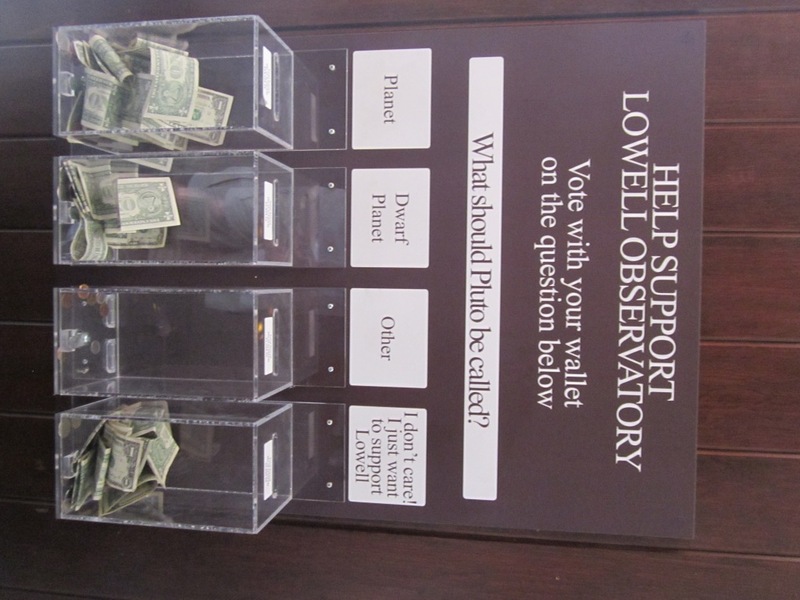 The name and monogram for Pluto are partly a recognition to Lowell. Today the observatory counts with several telescopes in different locations and employs about 20 full-time researches (PhD students included). It can be visited daily (12$ / adult) and with the visit some guided tours performed by the researchers are included. 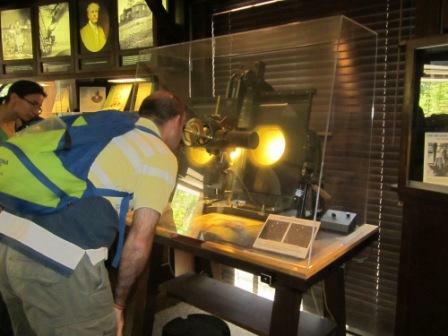 I definitely recommend the visit to the observatory for the science and history behind it. During our visit it was possible to observe the sun through a telescope (see picture at the right) during the day and more observations were to be organized during the evening. Thus, even if we did not do it like that I recommend planning the visit to the museum in the afternoon or at least staying over at Flagstaff the day you visit the museum (you can leave the museum and return in the evening with the same ticket for the observations). Comparing pictures to detect planets (at Rotunda Museum). The tour we joined ended up with a visit to the Rotunda Museum (within the Observatory) where we were given more explanations and we were shown artifacts from Lowell’s time. There is an area in the museum used for temporary exhibitions, which in the days we visited it was dedicated to the evolution of space suits used by astronauts. I do recommend the visit to the museum whenever you happen to be in Flagstaff (good stop over when visiting the Grand Canyon). (2) Recall that in 2006 the International Astronomical Union established some conditions for an object to be considered a “planet” and Pluto failed the test and was “downgraded” to “dwarf planet”.